ONCE upon a time mere mortals were afraid of vampires. Once. But no more. Wary, yes. Afraid, no. Starting as far back as “Buffy the Vampire Slayer” (film and series) right through to “True Blood” and other tales of the undead, vampires are not the dreadful, terrifying creatures of yore. All of this brings into the conversation “Dark Shadows,” the Johnny Depp-Tim Burton film inspired by the gothic 1960s soap opera of the same name. The film opens nationwide today. Wisely, JD and TB keep it light. But who really expected the pair to go the road most traveled? Not anyone who is familiar with their many collaborations. Besides, it would have been akin to driving a stake into the heart of a vampire to make the film scary instead of funny. (See video above). "Dark Shadows" both spoofs and reimagines the soap. JD’s Barnabas Collins resurfaces in the year 1972 after two centuries of captivity at the hands of a jealous witch. Her spell transformed him into a vampire. Barnabas' return to his beloved Collinwood Manor is bitter-bitter. The family's Maine estate is in disrepair and his progeny is a despairing and lost lot. It is left to Barnabas to set things aright in this strange world with his even stranger kin. These circumstances drive much of the comedy and camp in the film. JD gets solid support from Michelle Pfeiffer and Helena Bonham Carter, among others. JD fans will love the film. “Dark Shadows” fans maybe not so much. 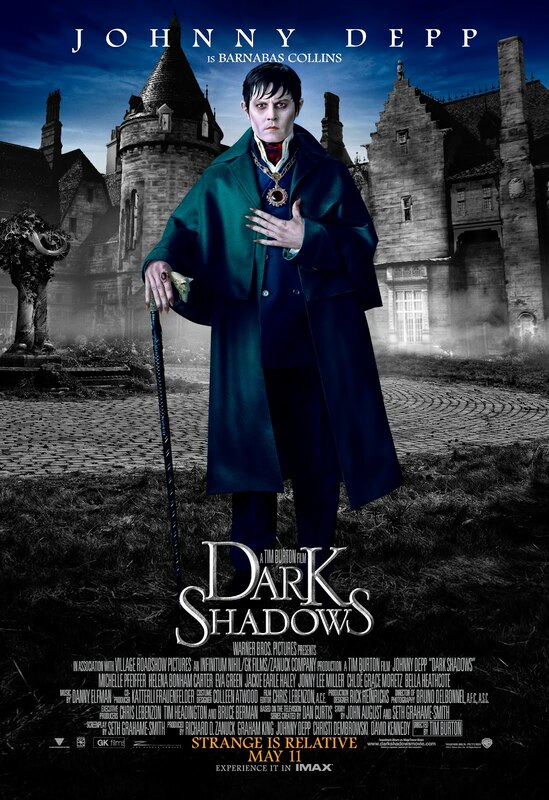 Dark Shadows is rated PG-13 for comic horror violence, sexual content, some drug use, language and smoking.